I've always wanted to start a Warhammer Fantasy Empire army! Due to the tactical depth of the army, the flexibility on the battlefield and the possible list diversity, as well as the background, has been fascinating me. However, I could never struggle through an imperial army from scratch, especially because many of the units visually didn`t appeal to me (especially the state troops) and I - like most hobbyists – were working on several other projects, therefore time has been short. 'Mercenaries', European Infantry 1450-1500 Content: Pikemen, crossbowmen and handgunners (40 figures). You can build up to 12 crossbowmen (with pavises), up to 12 handgunners, up to 18 pikemen (12 of which can be converted to polearms) and includes 4 command figures. Wars of the Roses Infantry 1450-1500 Content: You can build up to 30 bowmen, up to 18 billmen and includes 4 fully armoured command. Mounted Men at Arms 1450-1500 Content: This box contains 12 mounted Men at Arms that can be used for most European armies. There is separate horse armour for mounts if needed and 7 different horse heads (25 in total). The Men at Arms have 14 right arm options and 12 head options (per 4 riders). There are also lance, sword, mace, warhammer, axe and standard pole/spear options. Foot Knights 1450-1500 Content: The box contains 38 multi-part plastic figures, 17 flags, unit bases and information sheet. In addition, the famous DaVinci tank was used as a Steam Tank replacement. Basically, I am very pleased with the painting and the formation of the army. Only in the character models, I think an alternative should be found because the character models used from the Perry Range do not have a good casting quality and don´t reflect the character selections from the Warhammer Empire army book - in my opinion. Whereas the remaining units could easily be used as alternatives for the empire units from the book. But what alternative models for character models can be used for the Perry empire army? The models have to be True Scale (rather than Hero Scale), should be rather low- Fantasy and simultaneously represent the corresponding selections from the Empire army book very well and fit into the scheme of the Perry army. Not an easy task! After some research on the internet, I found a very nice and obvious solution that perfectly meets all conditions - the usage of GW Lord of the Rings miniatures as character models for the army! These are low- Fantasy, thus fit well to the medieval setting, are in the true scale and have is a large variation in matching models. So I once stocked up with several models of heroes from the Lord of the Rings range. War Altar: As a (medieval) alternative model to the war Altar of Sigmar, the Carrocio from the Perry brothers fits very well! Carrocio. Pistoliers: There will soon be a plastic light cavalry box from Perry miniatures that I will definitely catch! Light Cavalry 1450-1500. Content: There will be 12 in the box and can all be assembled as hobilers/coustiliers, mounted crossbowmen or mounted bowmen and come with command options. Very good stuff. Thanks for sharing. I love Perry medieval models in your arrangement. Thanks! I also really like the Perry style! Perry miniatures have that unique style that I love! Good work! Thanks very much. I really need to continue working on my army! 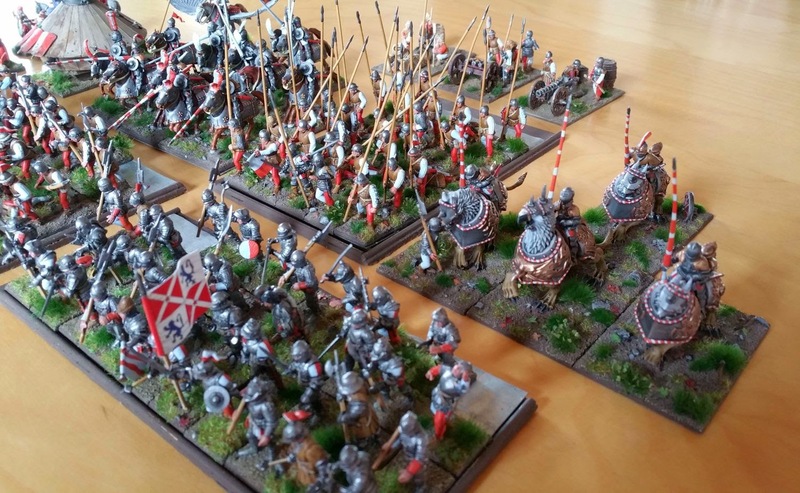 I really want those pikemen, but the box you linked had other diffrent units included aswell. I need the pikemen only so I was thinking of the english civil war pikemen: https://www.perry-miniatures.com/product_info.php?products_id=1867&osCsid=22c1a97jhgj049dtf87uqf44b3. Would they fit in size and theme in your opinion too? Hey, it really depends on what style you prefer. I generelly like plastic miniatures more than metal ones. Therefore I would choose the Mercenaries Box. Additionally the box is way cheaper than the metal pikemen you've linked. From the size point of view, both would fit perfectly. 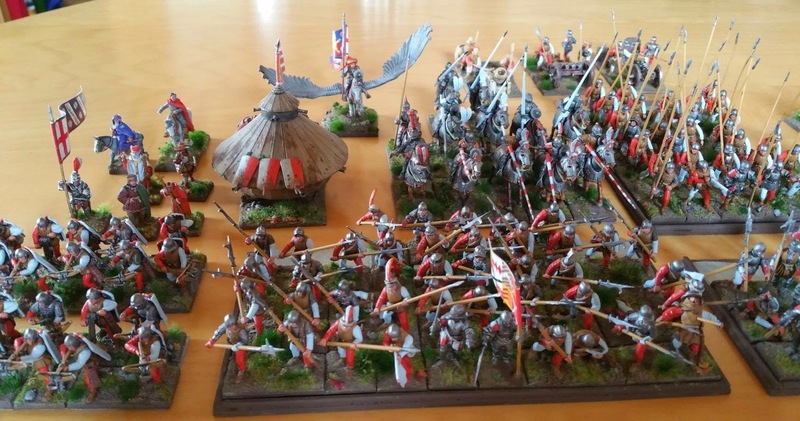 I would have decided on the mercenaries box in the first place if it wouldn't include all the other units like the crossbowmen and handgunners, I really only need the pikemen, that's my problem.